Dimensions: 9 3/4" x 2 7/8"
Pentek GAC-10 10"x2.5" Granular Activated Carbon Taste and Odor cartridge # 155109. Excellent 10 inch Taste and Odor reduction cartridge that can also remove Sulfur / Hydrogen sulfide / Rotten egg smell. Water Filter Compatible With Culligan, Ametek, US Filter, Plymouth, Kleen Plus, American Plumber, Bruner and Many Other Brands. Excellent Taste and Odor reduction cartridge that can also remove sulfur / hydrogen sulfide / rotten egg smell. GAC-10 Blue Water Filter Cartridge for Taste and Ordor removal, granulated activated carbon. 155109-43. Pentek Ametek 155109 GAC GAC-BBS cartridge effectively removes bad taste, reduces odor and chlorine from drinking water. They are designed for maximum contact between water and carbon media. The narrowing end helps prevent channeling. As water passes through the filter, it passes through a 20 micron pad to prevent carbon particles from leaking into your filtered drinking water. 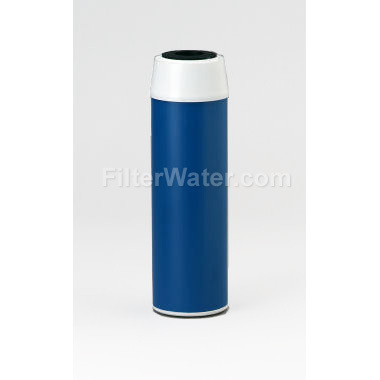 Filter size: 9 3/4" x 2 7/8"
Fits following Brands: PENTEK, Cuno, Filterite, Keystone, U.S. Water ( US Water ), Water Resources and most Harmsco filter housings. Compatible with Culligan, Ametek, US Filter, Plymouth, Kleen Plus, American Plumber, Bruner. Also compatible with Sears Kenmore Ultrafilter cartridge 34372, models 625.343800, 625.343820. Great filter. we had a terrible chlorine problem with our city water. Had been using a carbon block filter from Walmart. It just wasn't working. I ordered this GAC-10 filter, plus a CQ-R5 and installed them in series. We now have perfectly clean and clear tasting water. And we actually have better water pressure than when we were just using a single cheapo filter. I highly recommend these filters.